Share the post "Papery Peep February 2015"
Another month has already rolled round, time seems to be flying. As it’s the last Wednesday of the month, it means it’s Papery Peep day, hooray! Time for me to share my month in paper with you and invite you to do the same. 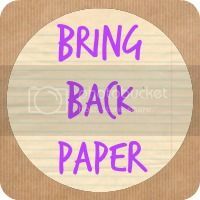 Whether it’s an update on your #BringBackPaper activities, this month’s stationery swap or just some books or stationery you fancy showing us, please do feel free to come share! ‘Tis a linky for all things papery! The first big thing I wanted to share with you this month is National Stationery Week, that runs from 27 April to 3 May this year. National Stationery Week celebrates the written word and all things stationery – the wonderful products which make it all possible, and give so much pleasure to so many people. 2015 marks the 800th anniversary of the Magna Carta, and is a reminder of how well handwriting has stood the test of time. It also sees the launch of #WorldStationeryDay on 29 April, as part of National Stationery Week. Firstly, I want to tell you about that funky green stapler there. It’s made by Kokuyo, and is a staple free stapler – how cool is that?! It comes in a great range of colours, retailing from £8.95, and binds paper together by punching a slit into the paper. When I first tried this, it did blow my stationery mind a little! No need for staples, no risk of injury and it’s so quirky! The Zebra pens I love. In a range of bright colours and designs, and the ink is the same colour as the pen – I really like that, as more often than not a lovely pink pen still writes blue. They have grips to make them comfortable to hold, and easy for little ones, too (Boo’s already commandeered a couple of these! ), as well as the Sarasa pens having rapid dry ink. The Nu notebooks are lovely, with that little black one there having a magnetic strip to keep it gently closed, too. Nuco International offer a great range of notebooks, from handbag sized to this larger A4 pad, which is coming in handy now for me as a blog book. Then finally I have that rather special Sheaffer pen there. It’s their Sagaris ballpoint pen, and is so smooth to write with. It’s weighty enough to feel luxurious, but not so that it slows you down! I’ve been using mine to write in my journal this month. You can find out more about all of these suppliers over on the National Stationery Week website, and you can follow @NatStatWeek on Twitter and use any of these hash tags to get chatting stationery there – #NatStatWeek #GetBritainWriting #GetKidsWriting #writingmatters #lovestationery I’m bound to see you there! Nothing like getting a gorgeous pile of stationery in the post! I’ve enjoyed them all, but I’d say that Skin and Bones by Tom Bale stands out the most for me as I read that one within a couple of days as it was a struggle to put it down. I’ve passed it onto the Husband to read now, which is kind of a big deal as he and I have only ever read two of the same books before, and I’m looking forward to hearing what he thinks of it. I’ve also ordered another by this author, as this was my first and I’m keen to read more! Now it’s your turn to share. Grab the badge from my sidebar there to pop on your post, link up and please take the time to comment on a few of your fellow linkers’ paper, too. Thanks! Hope you enjoyed ‘peeping’? #BringBackPaper runs every Wednesday here, and next week I’ll be launching the March book swap, so do pop back for that! Stationery week?? Now that sounds GOOD! I’m so looking forwards to Stationery Week, although I realised that I’ll be away for most of it 🙁 But I will be on Corfu with my best friend, so I’m sure I’ll cope. I went to the London Stationery Show last year and had a brilliant time there. Yes, I think you’ll get over it in the sun! I received my stationery swap today and was thrilled. Thank you to you and my swap partner, Debbie. I feel very spoilt. I’ve just written a post about it on my new blog.